I am very much the person who writes things down, if you haven't already noticed, ahem. I have, after all, apparently been keeping very detailed--and very odd--to-do lists for upwards of twenty years, and they've always included other bits and bobs, such as story ideas, lesson plans, diagrams of weird things I want to build, itineraries for trips I haven't (yet) taken, etc. 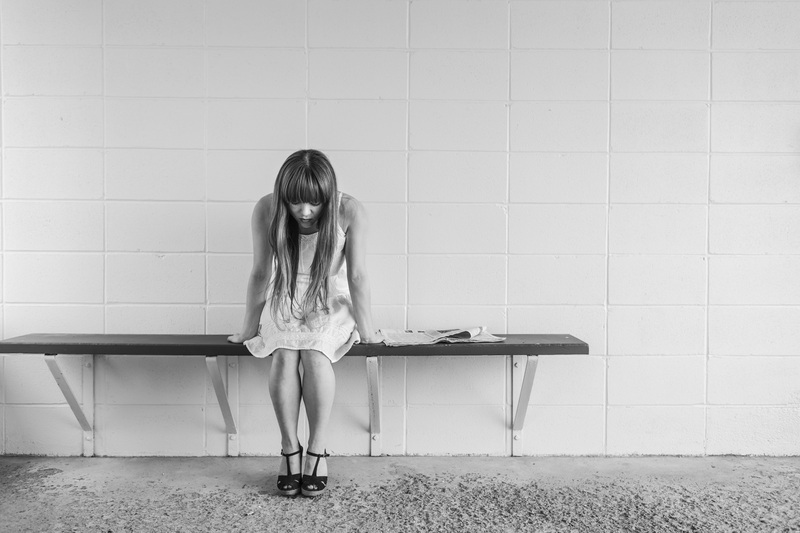 So why on earth add one more blank book to my backpack? To keep my book list in one place. To have a place to plan my garden. Noting something nice, or something important, that happens each day. Tracking all the cities, states, and countries I've visited. 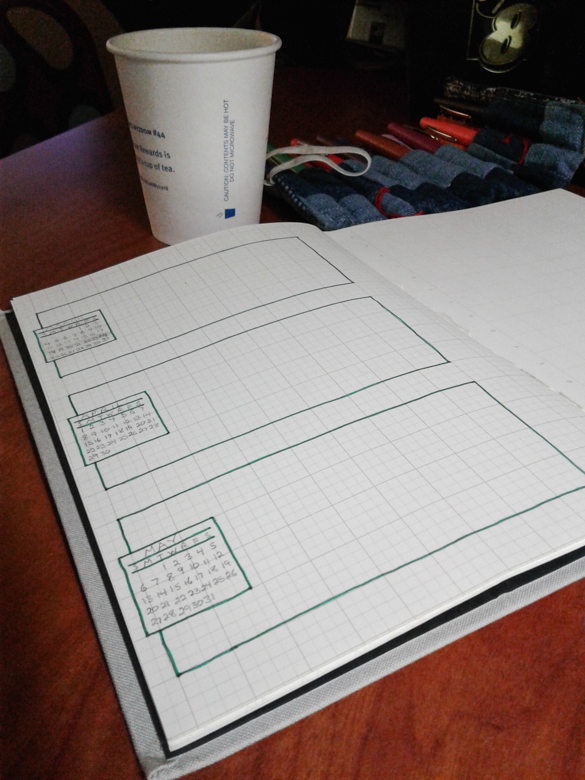 I've been using Beyond Bullets (which I received free from a publicist) to give me inspiration, and this Grids and Guides book (which I also received free from a publicist, but that was literally back in 2016 so I don't think it counts anymore--oops!). I really like both of these--Beyond Bullets is better than just looking through Instagram for inspiration, because it has more hand-holding, and a LOT more ideas to look at all at once, and the Grids and Guides journal has several different types of page grids so that you can do some really different layouts, or just experiment with all of them to see what you prefer. 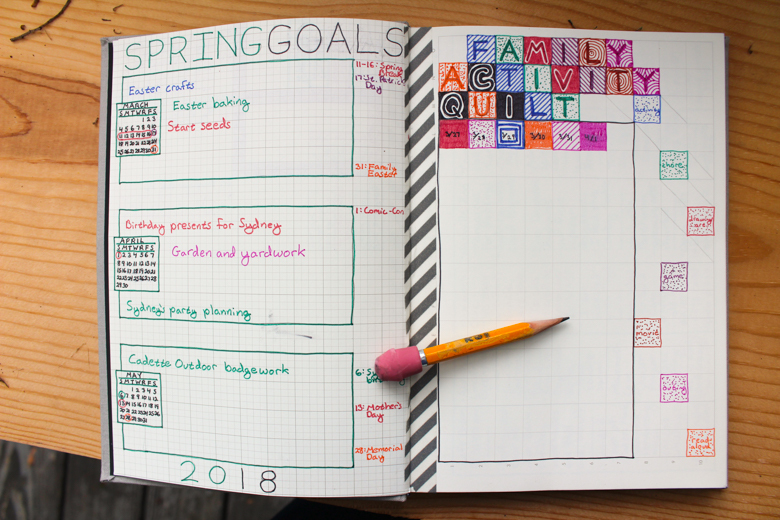 I've been working on my bullet journal for about three months now, and here's what I have so far--and what's working and what is absolutely NOT! I wanted it to look like a bookshelf, with the book titles looking like books, something like this bullet journal or this book tracker, or this one. I didn't do it right, though--it turns out that if you try to draw books as if they were rectangles then they look like rectangles, not books. I also wanted to be able to include a sentence to remind me about each book, but I don't have room to do that with every book using this format. BUT I really like the look of the bookshelf! I'm going to continue filling this page out the way that I started, but I'll hopefully have come up with a better idea by the time the page is full. I took this calendar format from Beyond Bullets, and I LOVE it! This was a big win, because it's exactly what I wanted to be able to record, and it came out looking great, too. 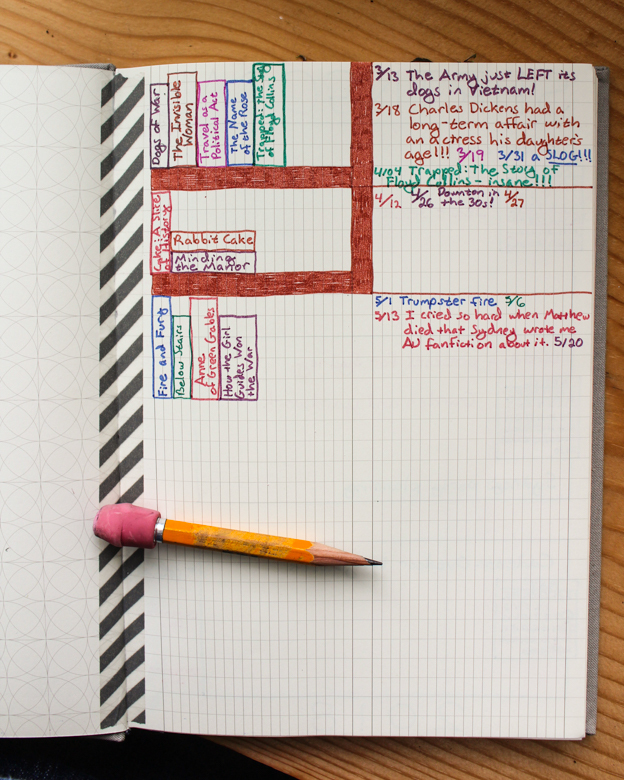 I wanted a way to keep notes when I travel, but there's no space for that in my planner. This calendar format is really good for it, however--I still have to be thoughtful about what to include, so it keeps it to the highlights. I kept this travel journal partly during our Spring Break trip to Nashville, finishing writing up the last couple of days at home. 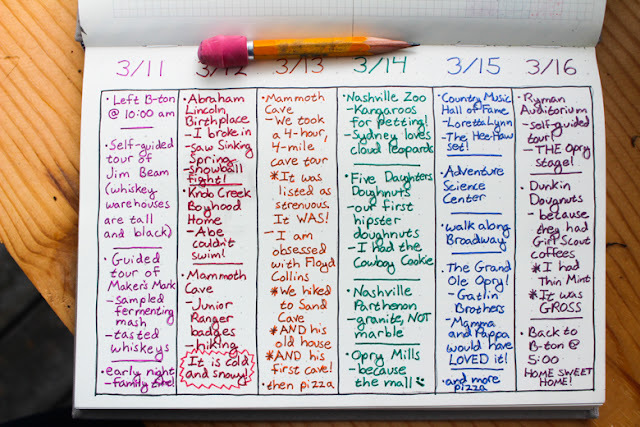 I also really like this travel journal with the route marked, and this one with the photos. 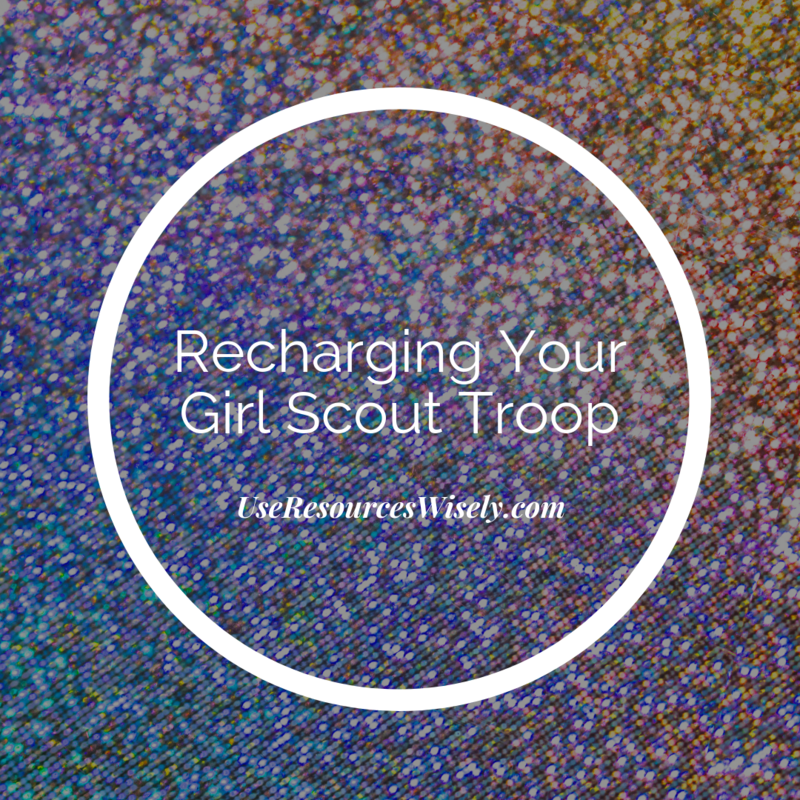 The kids own that instant camera, but aren't in the habit of taking it on trips. I do not need one more thing (or to pack one more thing! ), but I super want one of those travel photo printers. Here's another useful layout that I've made, though--my garden! It's a work in progress as my garden comes together, so I've only got down what I've actually got placed and planted so far. The penciled squares represent some perennial herbs that I don't want to move (and can't identify...), so I'll likely build more rows aligned with them when I plant the rest of my veggies. I want to include information and instructions, but I can already tell I won't have room, so perhaps I can tape seed packets to the facing page, as well. I expect this page to be super helpful, because by the next year I've forgotten much of what I did in the garden the previous year--I'm sure, for instance, that last year I knew the names of those herbs! 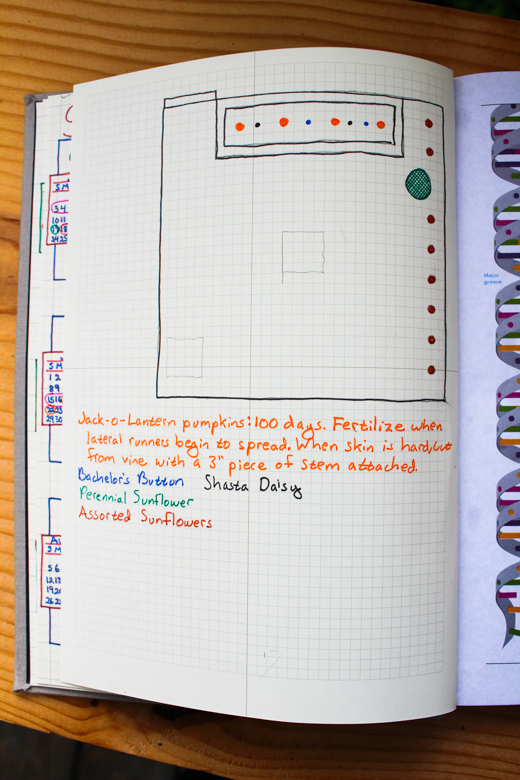 I'm tentatively color-coding the garden plants, but I like this garden journal that uses a key, and this one with a nice and tidy layout, and this one that has a calendar and to-do list with it. It's a map of all the states that I've visited! I printed a one-page map of the US from Megamaps (I have used that site all the freaking time since the kids were toddlers! ), and used my graphite pencil transfer method to transfer the map to a double-page spread in my bullet journal. Then I used Prismacolor watercolor pencils to color in all the states that I've visited. I only count states if I actually did some sightseeing in them, and I don't count them if they were just drive-through states, so that's why there are some weird gaps. I've definitely been in Idaho and Nebraska, but I didn't stop unless it was at a gas station or motel, so they don't count. I'll be coloring Maine in later this summer! 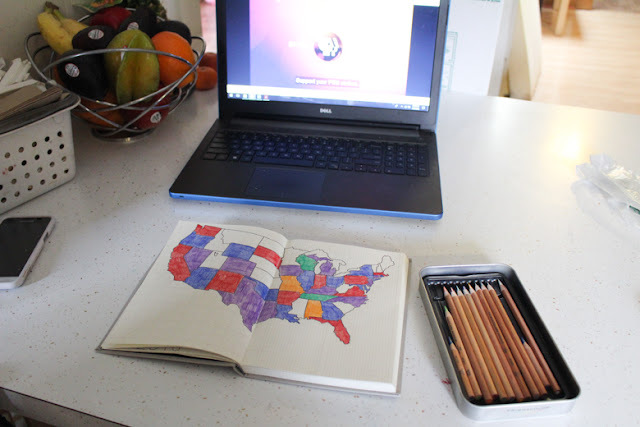 I also want to add a map of the world where I can color in countries I've visited, and maybe one of North America where I can draw in roads and highways, because I think it would be interesting to see my various vacation routes over the years. I have a ton more pages in my journal, and a few ideas for more pages to add. I like this layout for movies that I've watched, and this menstrual cycle tracker, and a bullet journal-sized circular perpetual calendar where I can put birthdays and holidays. I'm also in a Facebook group for parents who use bullet journals for homeschooling, but I haven't actually thought of any way to do that for myself, yet. Got anymore ideas for me? Man I've been out of the loop for a while! 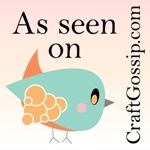 I love bullet journals, and I am super excited to check out those books! 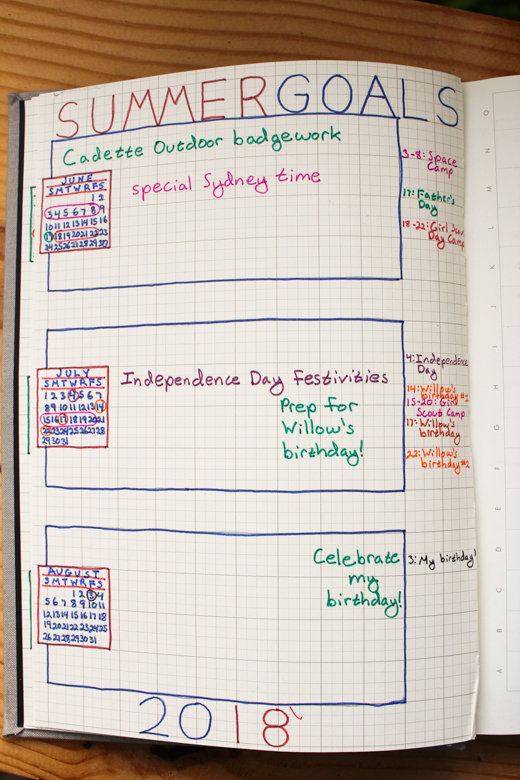 I've lost some of my creative mojo, so mostly I use my bullet journal for day-to-day stuff. I use to be a lot more creative with it. I love the travel journal pages you have! We are getting ready to make a trip to NH and I think I may need to give this a try.